Our Companies | Coffee Holding Company, Inc.
Organic Products Trading Company works directly with small-scale farmers around the world to source high quality green specialty coffee. OPTCO imports the finest in Certified Organic and Fair Trade co-operatives, as well as conventional farms that focus on improving their communities, their families, and their environment, OPTCO’s mission is to support coffee producers by providing market access, in addition to collaborating on development projects, gender equality initiatives, harvest finance, and quality improvement programs. 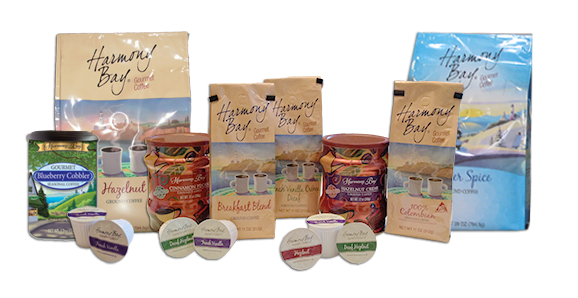 Harmony Bay offers quality ground coffees in a patented packaging format for customers who prefer the superior taste of 100% Arabica coffees, but don’t want to grind their own beans. Roasted in small batches and packaged in attractive and distinctively shaped steel containers with easy open lids, K-cups, and bags in sizes from 11 to 40 ounces. Sonofresco offers a complete line of American made coffee roasters suitable for commercial operations, retail shops, or home-based coffee businesses. Sonofresco roasters can produce exclusive flavor profiles in batches as small as 1/4 lb. to 55 lbs. of retail-ready coffee in an 8-hour period. In addition to high-quality roasting machines, Sonofresco offers venting equipment, replacement parts, ADR software, and specialty coffee.